We don’t have to tell you what happened since our last quarterly report. A picture is worth a thousand words. Now that panic has set in, it is time to review what happened, have some perspectives regarding the years to come and position ourselves to benefit from the upcoming recovery. The reality is that if you had not been out of equities a year ago, it is too late to get out now! · First observation: market timing does not yield a good risk/return ratio since the punishment for missing the best days is quite harsh. · Second, if you missed the extreme days (both up and down equally), you basically would have had the same return as if you had been in the market all along – with one difference: it is much easier to be fully invested all along since it does not require any skill (doing nothing is always easier than doing something, especially if the results are roughly the same…). We then went one step further to see whether we can develop some sort of market timing device to catch those best days and miss the worst days. We plotted those extreme days on a chart to find out where they were and to see if there were any clusters that are observable. Unfortunately, they tend to be clustered together and the best days followed the worst ones and vice versa, i.e. we would have had to have the guts to buy in after a 10% drop on a given day and subsequently sell the next day during the most volatile periods in the market. We think you will agree that it would be wishful thinking and un-executable. In conclusion, a market timing strategy is at best very difficult to implement and rarely successful over the long term. If you agree with us that 9-10% equity return is quite reasonable, then you should be fully invested at all times. Below is a chart of the long-term performance of the S&P 500 since 1968, a 40 yearperiod, which, coincidentally, is also the peak preceding the most severe recession since 1929. The trend line shown represents the average annual growth rate of the price index and is roughly 8.5% per annum (for those of you who love statistics, it is a regression line with a slope of 8.5%). · The market, despite all the fluctuations year in and year out, manages to grow at an 8.5% rate over the long term, before dividends. There were periods of excessive optimism which have led to major corrections, followed by periods of excessive pessimism which, in turn, have led to substantial recoveries afterwards. All in all, if you had ignored the noises and stayed fully invested, your return would have been around 8% plus dividends. Better yet, if you had invested regularly, i.e. equal amounts of money every quarter or every year, your return would have been higher still. 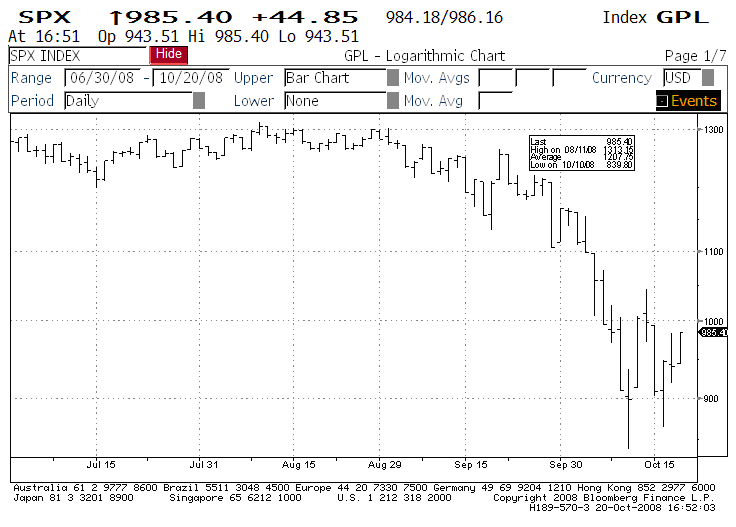 · There are 2 twelve-year periods when the market had provided no appreciation: 1963-1974 and the current period of 1997-2008. If the current period resembles that of 1974, then this is probably one of the best times to buy equities. The 5 year total return from the low of 1974 was 75% (from October 1974 to October 1979) and the 10 year total return was 267% (from October 1974 to October 1984). 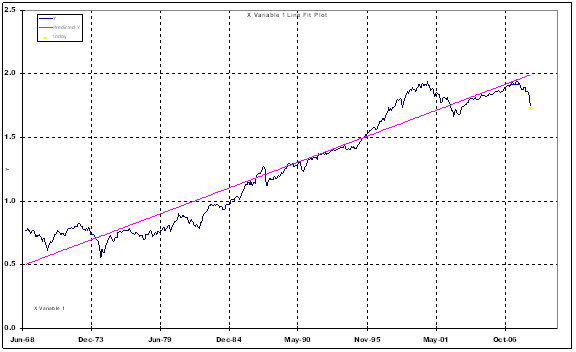 · You may have noticed that the market fluctuates around the pink trend line which is its long term growth line. Thus, it would not be outrageous to assume that eventually the market will move back up to the trend line. Again, for your information, the S&P 500 would have to move back up to 1725 (where the trend line is), which represents an 86% move. If it takes 5 years to achieve this recovery, it would give an investor who buys in now an annualized return of 13.2% before dividends. Excessive leverage and speculation among the financial institutions have put the world in a dire situation. Their problems are leaking into the real economy and it is most likely that we will enter a recession, if we are not already in one. Unemployment will rise, business activity will slow and newspapers will continue to report scary headlines. So, what should an investor do? The answer is: BUY STOCKS, preferably with clean balance sheets. Unless anybody can give us an example of a recession that is not followed by a recovery, one simple rule should dictate our decision to buy: stocks are cheap when people are fearful. And most certainly, fear is now widespread. We are not trying to predict the turning point here because we haven’t the faintest idea as to where the market will be in the short term. However, the market is likely to be higher before the economy recovers and newspapers report good news. Besides, the market is not that naïve to hand you a bargain if there is nothing wrong with the economy, but if you believe in the long term prosperity of America and that there will be a recovery (as there has always been), then bad news is your best friend since it allows you to snap up a piece of America’s future at a marked-down price. Today, cash and bonds seem to provide some comfort to the stunned investors who are willing to take almost zero interest in return for peace of mind. Yet, these are terrible assets over the long term, especially at current interest rate levels. Indeed, in order to bail out the financial institutions from their crisis, government policies have always been inflationary in nature (because it always involves printing money) and will make the real value of your cash decline. As Warren Buffett said in the New York Times: “Equities will almost certainly outperform cash over the next decade, probably by a substantial degree. Those investors who cling now to cash are betting they can efficiently time their move away from it later. In waiting for the comfort of good news, they are ignoring Wayne Gretzky’s advice: “I skate to where the puck is going to be, not to where the puck has been””.